Looking For Party Hire In The Southern Highlands? If you are organising an event or party in the Southern Highlands, Sydney’s tried and tested party hire service Walkers Party Hire is here to help with a full range of party hire in the Southern Highlands. Walkers Party Hire is a one-stop Sydney based Party Hire Service, within easy reach of the Southern Highlands from our Peakhurst head office; we have been facilitating parties across Sydney and New South Wales for over 50 years. We are a one stop party shop, offering full planning, set-up and pull-down service, in addition to providing a full range of party hire equipment including marquees, flooring, furniture, decorative, crockery, heating and cooling. And, we use our fleet of covered vehicles to transport our spick and span party equipment to Berrima, Bowral, Bundanoon, Mittagong and Moss Vale and other parts of the Southern Highlands. The Southern Highlands is a desirable area to both live and visit. There are a number of resorts such Briars, Berida Manor, and Peppers, which are also of historic significance in the area. So if it’s a wedding you are planning, the Highlands is the perfect backdrop for your special day. With so many country properties, ranches, wineries, farms and gardens, and simply spectacular open spaces; it’s nothing short of perfect. A perfect wedding venue, it lets you step back in time with a vintage experience in a historic location, a fairy tale in a beautiful garden, a romantic ceremony in a quaint village church or a simple country style venue. With Bowral as the commercial centre of the Highlands, there’s so much to explore and entertain your guests around it’s boutiques, gourmet restaurants, Corbett Gardens, and renowned Springetts Arcade. Other interesting locations of the Southern Highlands being Mittagong, Moss Vale, Berrima; housing many historical buildings, making it a perfect destination to have your guests over from different parts of the world. There are a good number of excellent wineries in the Southern Highlands. Many of them have won national and international wine awards. Some of these may have facilities for parties and events in the Southern Highlands. They also have cellar doors and some have excellent restaurants. Some of the wineries are Southern Highlands Winery, Eling Forest Estate, Centennial Vineyards, Bendooley Estate and St. Maur Estate. Known for its colourful gardens, leisurely pursuits, diverse landscape, history and heritage, and welcoming accommodation, the Southern Highlands is an ideal place to hold parties. At Walkers Hire, we offer a full planning, set-up and pull-down service, in addition to providing a wide range of A-framed marquees, dome structures and pagodas, in clear and white vinyl; and other party equipment such as chairs, tables, lounge furniture, crockery, cutlery, glasses, decorations, flooring, lighting, heating and cooling for hire. We use only the best hire products available including Hoecker brand marquees, recognised around the world as the industry standard. All our marquees and party equipment are stable and safe, suitable for all grounds and fittings across the Southern Highlands. With our experience and expertise, we offer a wholesome party experience, offering the most exquisite marquee designs, matching flooring, stunning decor and beautiful light arrangements to make your event memorable. At Walkers Hire, it’s our life’s mission to give you the best quality party arrangements, taking care of quality and aesthetics both at the same time. So, if you desire a distinctive experience for your special event, Walkers Hire is an idyllic choice to give you a stunning setting on the rolling hills and expansive vineyards of picturesque the Southern Highlands. Some times it’s better to hire a marquee than rent a venue. We offer a variety of A-Frame Marquees of many sizes; ranging from 3m, 4m, 6m, 8m, 10m and 12m, making any combination of length and width suitable to your site, considering A-Frame Marquees are suitable for all events. The marquees are modular and can be configured into many sizes and styles to suit your event. Ideal for small events, Pagodas are a stylish option. Compared with a standard pop up shelter, they provide more headroom. We find they are ideal for corporate hospitality counters, trade stands and they also work really well as stalls for fetes. Also known as Wow Structure, these marquees are uniquely designed to give an edge to any average backyard party. They are 6m x 6m and feature 4 entry points that can be sealed with clear or white panels, considering Highlands cold winters. Our most sought after marquees, clear marquees are transparent marquees with see through roofs and walls. So, if you want minimalistic intrusion while weatherproofing your event at a picturesque location, then clear marquees are just the thing for you. They are glamorous and modern, offering a peek into your surroundings, letting in natural sunlight during the day and a view of starlit night sky during the night. We offer portable dance floors along with marquee hire, available in timber or vinyl; that can be sized to suit almost any room. Both timber and vinyl floors are available in a classic parquetry look or a fun black and white check. We can also create location specific flooring from scratch to work on uneven surfaces and to cover swimming pools. Our project coordinators can come to your the Southern Highlands property to assess the location and recommend the best solution for you. We specialise in table hire and chair hire for big and small events. Whether it is weddings, formal engagements, corporate events or just your average backyard party, you can choose from our wide collection of furniture to suit your venue. We even have glow furniture for hire. Made from lightweight poly carbonate, the glow furniture can be set to many colours, allowing you to change colours via remote control throughout the night. From lighting to urns to stages to centerpieces to table and chair covers, Walkers Party Hire offers it all. We stock the latest designs, in trend decor items and equipment, to make your event stand out. And, if you have your heart set on any particular decor, we can make it happen for you. All you need to do is call us for a free of cost site inspection. We offer a wide range of catering equipment for hire, spoiling you with lots of elegant choices. Our china cutlery and glassware hire range contains a variety of quality items which include tea cups, coffee pots, sugar bowls, saucers, plates, spoons and many more. We also offer a range of catering equipment to help with food preparation. Our food warmers are very popular for heating finger food or curries, casseroles and soups. 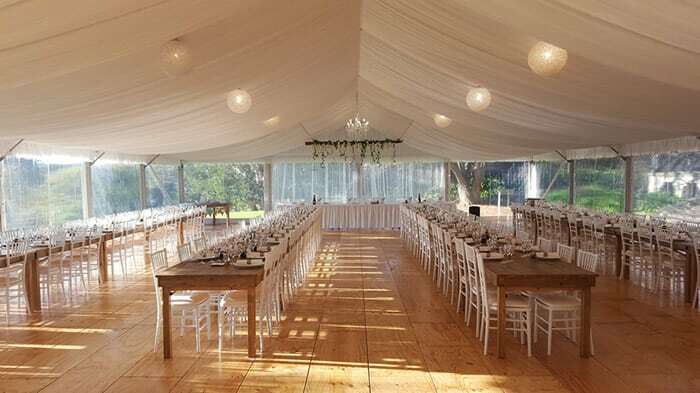 We can make our marquees warm and cozy with our heating equipment, even in the Southern Highlands’ cold winters. We have effective, safe to use, temperature control equipment to facilitate outdoor events even in extreme cold and warm weathers. We are a reliable event hire company with over 50 years of experience, responsible for supplying party equipment and services to events, parties and weddings across Sydney and New South Wales. We use our fleet of covered vehicles to transport our spick and span party equipment to the towns, villages and estates of the Southern Highlands. The fact that the Southern Highlands is within our easy reach, we can reach you on a short notice, taking care of everything from start to end, implementing even the most complex marquee designs. And we love doing it all! So trust our expertise in giving you a fulfilling party experience, being the perfect host to your guests. Read what customers have said about us. We have a team of experienced and well trained project coordinators, offering you a free inspection of your Southern Highlands property, giving you the best possible solution. Reach us by phone or email whatever suits you, or better, fill in our enquiry form to help us reach you. We promise to listen to you, to hear you, and to offer the best of party plans, tailor made to suit your needs. Reserve the best party equipment and accessories for your event today.